Turkey is the only country in Syria for humanitarian reasons, President Recep Tayyip Erdoğan said on Thursday. 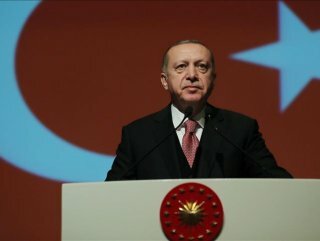 Speaking at a presentation ceremony of the Turkish Military Academy in the capital Ankara Erdoğan said that he was explicitly saying Turkey is the only country that is in Syria for humanitarian purposes. Erdoğan said Turkey has no intention to "occupy" Syria, but it has tried to ensure the security of its people. "Turkey ranks number one when it comes to providing humanitarian aid in proportion to its national income," he added. Syria has only just begun to emerge from a devastating conflict that began in 2011 when the Bashar al-Assad regime cracked down on demonstrators with unexpected severity.